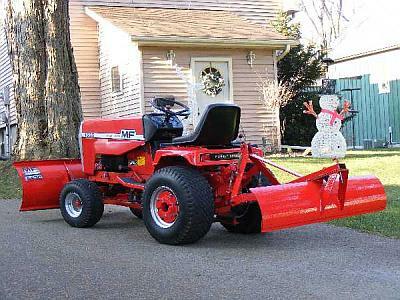 When did you get started in tractors? I got started in tractors prolly before i could walk. I been told i was making motor noices at 9 months old lol Had alot of toy tractors (and still do) I guess you can say I was a gear head at conception lol. My grandpa had an H and a 450 Farmall. Everytime I saw em I had to sit on em and "drive" em like every kid does. Then my grandpa bought and restored the 350 when I started school and that started it. Taking it to tractor shows. After awhile my dad started tractors so I got me farther into it. Then my 7th grade year I got my M. My freshman year I got into the Ag program at school. I did my SAE (Supervised Ag Experience) which is a record book that I kept on restoring my M. While I was restoring my M I got the Yeoman. Which turned out to be this past year's SAE along with the M and my truck. My SAE for my jr year is my 2010, Yeoman, M, truck, 350 and maybe watever else i can find. and now here I am with 2 tractors and 1 LT and 1 GT in the making which is a start of a life time collection lol. Two years ago - I picked up a Moto-mower for my son to use in tractor pulling. I grew up with a David Brown 1200. Always been a gearhead (hot rodder)....Just got into the tractors 3 years ago when I retired and bought a larger property......Its cheaper than the old cars too. Life long gear head. Mainly was into atvs ans 4x4s. After 30+ years ov atving the ole body needed a change of pace. About 4 years ago I came up with a T65 Panzer and that got me started. Don't have the Panzer anymore but I got Cub Kong. That's the one that really got me started. Subject: Re: When did you get started in tractors? » Iowa has some cheap tractors!